Have you ever accidentally stumbled into a dream come true? Like one that you could have never achieved by taking the time to dream and plan accordingly? This may happen on rare occasion, but RARE is the key word. Most people who advance radically through life did it with intentionality. Dreaming is important, especially if we want to live life to the fullest rather than just coast through a mediocre, run of the mill, rut of a life. The coasting style passively waits for life to happen to you; the dreaming style proactively causes you to happen to it. 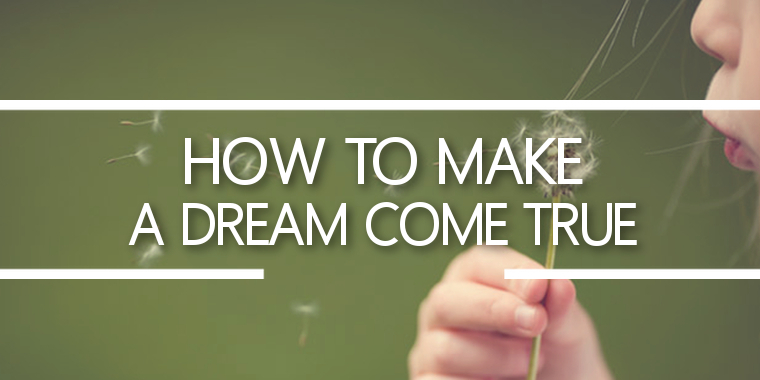 I want to encourage you to take dreaming seriously and do it well! If you don’t know what to do, start doing something. Some people are waiting for a dream or opportunity to just land in their laps before they will do anything. But usually you just have to find something productive to start doing first. Trust that once you begin cranking some gears, the wheels will start giving you motion. With motion, you can begin to turn the steering wheel as needed. Faithfulness with what you can do now will guide you to the right opportunities in the right time. Turn your dream into a vision, or it will remain just a dream. A vision creates purpose. Purpose creates conviction. Conviction creates motion with direction. Consistent motion creates momentum. Momentum produces results that eventually bring increasing fulfillment to the dream. But dreams that remain just dreams produce discontentment and aimless living. It’s better to fulfill one dream than to start pursuing ten and accomplish none. Take it in stride and find satisfaction in the one or two dreams you are currently undertaking. Focusing more on the next dream than the current one will cause you to miss the glory of the season you are in. Some dreams are catalysts for other dreams to happen. Some people, like myself, have so many dreams that they don’t know how they could possibly pursue them all. No worries! It’s not time for all of them yet. Sometimes the culmination of one dream is the birthing of the next. You may envision a door that you must get through down the road. But that door may be on the other side of a few closer doors that must be passed through. What door is God trying to get you through right now? His plans are progressive steps forward. Enjoy the journey. God does! What season has God led you into now? Good stewardship always yields increase. It’s because He knows He can trust you. Until you learn to fully embrace what God has given you in this season, He will not deem you ready for the next greater one. “Well done, good and faithful servant; you were faithful over a few things, I will make you ruler over many things. Enter into the joy of your lord,” (Matthew 25:21). Dreams are nourishment to the soul when the going gets tough. “Looking unto Jesus, the author and finisher of our faith, who for the joy that was set before Him endured the cross, despising the shame, and has sat down at the right hand of the throne of God,” (Hebrews 12:2). Nuff said! Converging your dreams with God’s ensures results. You can dream all you want, and pursue everything you want to pursue. But this doesn’t mean God is on it. Many people are convinced it’s God’s will because they have a dream and passion. Not necessarily. That can actually be an arrogant assumption. Consider God’s will for Abraham regarding Isaac. Sometimes we need to lay our dreams down on the altar so we can get our heart in a place where nothing but God’s will influences it. We can pray until we are blue in the face with no results if we are praying the wrong prayers. But once we align our will with His, that’s when we will start seeing prayers get answered. In other words, learning to let God’s dreams become ours is how dreams come true. “This is the confidence which we have before Him, that, if we ask anything according to His will, He hears us. And if we know that He hears us in whatever we ask, we know that we have the requests which we have asked from Him,” (1 John 5:14-15). When God knows we have put His dreams first, He loves to fulfill our dreams too. “You did not choose Me, but I chose you and appointed you that you should go and bear fruit, and that your fruit should remain, that whatever you ask the Father in My name He may give you,” (John 15:16). I hope that you will give yourself permission to dream dreams that are bigger than yourself. You must believe that you plus God equals infinite possibilities. What is God dreaming for you? Are you dreaming His dreams? I can tell you two things: it’s gonna be bigger than you, and it’s an invitation into the adventure of your life! Let Him make your dream come true. If you enjoyed this blog, please share it on your favorite social media(s)!